New York – The National Institute for Reproductive Health (NIRH) and the NIRH Action Fund announced today that they will honor Whoopi Goldberg, New York State Attorney General Eric T. Schneiderman and producer and founder of Carolines on Broadway Caroline Hirsch with the annual Champions of Choice award on May 1, 2018. The Champions of Choice Luncheon – held every spring in support of NIRH and NIRH Action Fund – honors and celebrates individuals who have demonstrated their commitment and used the power of their position to advocate for reproductive health, rights, and justice. Throughout her career, Whoopi Goldberg has been an outspoken advocate for women’s rights. She has used her platform on The View to counter harmful myths about women’s health, speak out against those who do not support a woman’s right to choose, and destigmatize the discussion about abortion by sharing her own life experiences. New York State Attorney General Eric T. Schneiderman has been a longtime advocate for reproductive health, rights and justice, beginning with his work in a clinic before Roe v. Wade became the law of the land. Working in partnership with NIRH, Schneiderman introduced New York’s Comprehensive Contraception Coverage Act (CCCA), which protects access to cost-free contraception; filed suit to protect access to clinics after anti-choice protestors threatened, harassed, and obstructed women seeking care; and much more. Caroline Hirsch, producer of Ask for Jane and founder of Carolines on Broadway, has dedicated her life to uplifting women and provides unwavering support for organizations that advance women’s rights and access to reproductive health care. Her most recent project, the forthcoming film, Ask for Jane, celebrates the Jane collective, a group of women in Chicago who helped 11,000 women obtain safe abortions before Roe v. Wade. The Champions of Choice luncheon will be held on May 1, 2018, at the Ziegfeld Ballroom in New York City. For tickets and more information, visit: https://www.nirhealth.org/champions2018/. The National Institute for Reproductive Health builds power at the state and local level to change public policy, galvanize public support, and normalize women’s decisions about abortion and contraception. 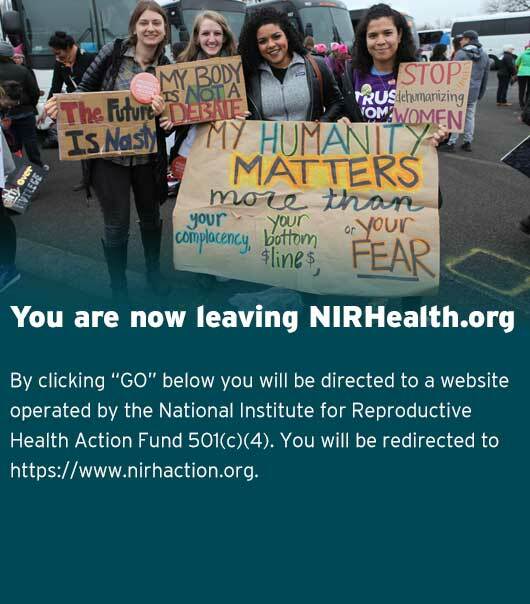 The National Institute for Reproductive Health Action Fund conducts non-partisan issue advocacy and electoral engagement to advance reproductive health, rights, and justice across the country.